Never heard of 'Thrillerama', 'VastVision', 'Atomsmasher' 'Cinemagic' or the pre-World War II optical musical-soundtrack Radiogram? Which long-forgotten film pipped 'The House of Wax' to become the second 3D feature film premiered in the UK? 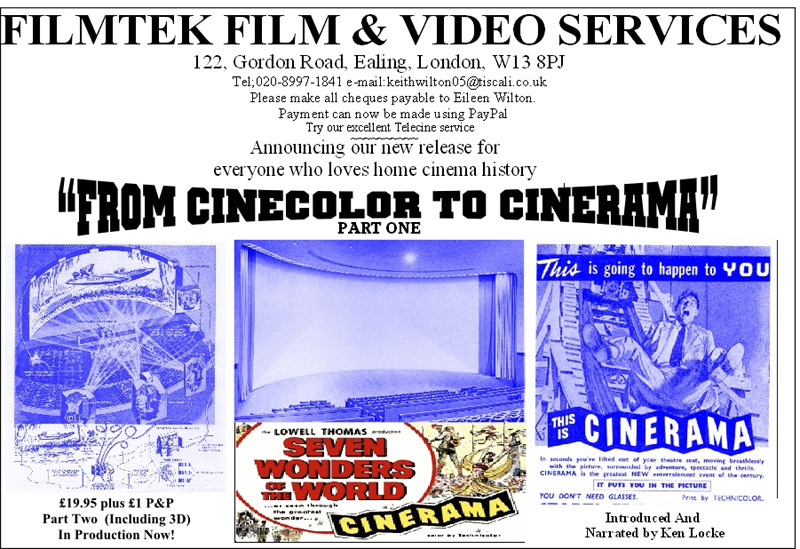 From Cinecolor to Cinerama is a glorious extravagaza of screen shapes, sizes and colour film systems with background information including rare items on 3D and anamorphic film processes - coming soon to a screen near you! Details for the next BFCC to be held 14th May 2011 at the Winston Churchill Hall in Ruislip can be found on the Next Event page.